Hello beauties! I'm super amped to be holding my first ever giveaway here on Dazzling Diva! Soooo exciting, right?! And because it was just that special, I wanted to make it a good one! And I thought the best way to do that was to gift one lucky reader a "Fall Fabulous Mini Haul!" To enter, use the Rafflecopter below. Each entry will give you points. The more points you earn, the closer you are to winning this awesome prize! After completing the mandatory entry, it will unlock more options that can bring you one step closer to winning! 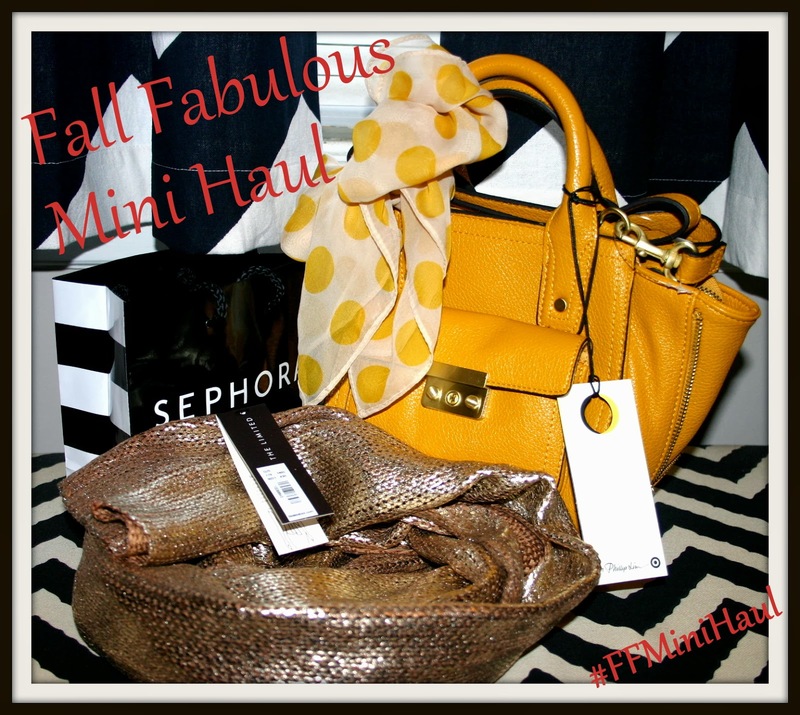 The #FFMiniHaul Giveaway will run from 9/26 - 10/3. The winner will be announced via Rafflecopter and contacted through email. This giveaway is only open to US and Canada residents only. I can't wait for all the pretty fall leaves. I'd like to enter your competition but I live in Ireland. I appreciate that you have specified that it is for US/Canada only but I would so love to win this - especially the Philip Lim for Target Mini Satchel (we don't have Target over here!). I would be grateful if you would let me enter and if I should be lucky enough to win I would pay the difference in shipping? Hi Mia! Thank you for your interest! How could I possibly say no to such a gracious request?! You are welcome to enter and we will discuss shipping details if you're the winner. Good luck! ––––––––– I'm most looking forward to fall so I can start layering & wear tights ! I'm also looking forward to Season 3 of Scandal ! I'm OBSESSED with this show . Ohmygosh, Nicole, I am totally with you on Scandal! I spent the last two weeks watching the first two seasons and I am on pins and needles waiting for the premier next week. Olivia Pope is EVERYTHING! And thank you for your interest in my giveaway. Good luck! I love fall for the cooler weather, hockey season and Halloween! I always look forward to going on nature walks & enjoying the cool fall weather. I think fall is my favorite season because I love bundling up in layers and cozying up on the couch under a fuzzy blanket with a good book and a cup of tea. I also love how gorgeous the leaves are! I have to agree with you there, Kassie...what you described sounds like my PERFECT Sunday! Thank you for visiting & good luck! Autumn is my absolute favorite time of year! Halloween, crisp air, orange leaves, season coffee drinks, warm clothes, bonfires! Can't wait for sweater weather!! I am looking forward to a cold day with the sun shining. It is our first fall in this house in the countryside so I am looking forward to the adventure. In Vermont?? What isn't to love about Autumn?? The mountains when they are ablaze in color. Sugar Maples when they are that awesome golden color. Apples!! Cider donuts made with fresh cider. The cool "autumn air" scent. My favorite flannel shirt. Pumpkins and all the pumpkin yummies that go with it! This could go on forever!! You do make it sound wonderful! And it honestly sounds a LOT like being here in Pennsylvania too! Thanks a bunch for visiting & good luck! I can't wait for cozy sweaters and hot chocolate!! I'm looking forward to the awesome fall outfits! Cool weather and all the beautiful color changes. I'm looking forward to cooler weather. I'm with you on that, Amy! I'm a little over salads with fruits, I'm a meat 'n potato kinda girl so I'm ready for pot roast! I'm happy you like the giveaway! Good luck! I am looking forward to wearing some of my beautiful fall sweaters and scarves. And I am tired of all the insects that come with the warm weather...so many spiders! LOL! I want to wear boots, hoodies, & beanies! I love the weather and the clothes! I think sweaters are so flattering and the colors are gorgeous. My Wife would love that purse!!!!! Fall is my favorite time of year! The air is perfectly cool and crisp and I live in New England where the colors simply can't be compared! The weather is what I'm looking forward to about Fall. I'm looking forward to the weather and fall outfits. I like to wear more layered clothing and sweaters. Fall colors are my favorite. Looking forward to scarves, sweaters and slouchy hats. An excuse (reason) to wear my boots and tights. ... and a reason (excuse) to drink hot chocolate - a lot! I love the rich colors of fall and gravitate towards gemstone hues: rich reds & blues, dark greens and, ahem, the deep yellow of this purse. I can possibly lower my electric bills by turning off the AC. I'm looking forward to the cooler weather and to all the leaves changing colours! I'm glad for cooler weather---cool enough to wear great clothes! Fall is great because I can break out my boots and funky scarves. Also, the colors of Autumn are the most beautiful and I love seeing the trees change each day. I'm looking forward to the changing of the leaves and getting back into a routine. i can't wait to wear cute sweaters and boots! I love the crisp air of fall- and of course, i love getting to wear my boots again! Thanks for the sweet giveaway! Fingers crossed! I always look forward to Starbucks Pumpkin Latte and the crisp air. I love Thanksgiving, Halloween, colour change in leaves, & cute boots. I'm looking forward to kicking up big piles of maple leaves this fall! And to drinking pumpkin lattes and taking Halloween pictures. :D My favourite season! Fall = sweater season, enough said! Boots, boots, and more boots!! I'm most looking forward to cooler weather and wearing boots and sweaters! I'm looking forward to fall to wear all different kinds of layers, booties, skirts, leggings everything is just too exciting! So I can wear all my Fall clothes! I love wearing sweaters in the fall! And eating pumpkin pie. It's the start of the long, fun holiday season. I'm looking forward to all the vibrant fall foliage, and football parties and tailgating! I can't wait for the cooler weather. I am so done with this heat! Love the blog and love the giveaway!!! Hockey season and apple picking! I am looking forward to the cool weather! I'm looking forward to breaking out all my favorite Fall clothes...I love sweaters! I love Fall because of the cooler temps and for everything PUMPKIN! lol..I wanna win this for my Aunt whose birthday is 10/13..Thanks for the chance! fall is my favourite season - I love the cooler temperature, the crispness of the air, the changing colours of the leaves, and the warm bevvies that I get to sip. It's perfect! I love the pretty leaves! the great weather and food! I'm looking forward to the leaves changing and being able to wear my sweaters and boots again! The weather is crisp, cool, & perfect~love Halloween & Thanksgiving..and also the changing leaves are beautiful!